In speaking with students afterward, wheelchair basketball was a hit. During our Adapted Sports Day event, one wheelchair basketball shoot-around was a picture of inclusion. It had kids with various disabilities dribbling a basketball next to college students without disabilities shooting a basketball next to a local wheelchair basketball team member instructing technique. At that moment, it became clear that wheelchair basketball would be an easy way to introduce college students to a new sport while also offering an opportunity for a college student with a disability to play intramurals. Too often adapted sport is considered to be “just for them,” meaning it’s only for people with disabilities. This modern-day form of othering isn’t going to just go away. It must take a conscious effort to foster an inclusive environment. Sport can do that. Sport is an international language, and it is particularly influential among college-aged individuals. Time and again, when we host adapted sport events at JMU, student volunteers walk away speaking about how they have a new appreciation for disability sport and adapted sport. Now, imagine if they actually played those sports. Yes, students without disabilities playing a sport that is often considered only for people with disabilities. Imagine if a half-day wheelchair basketball clinic were held in the fall semester at a university’s recreation facility to expose students of all abilities to a new sport option of wheelchair basketball. The educational piece to that is ensuring the students view adapted sport as just another form of sport. Imagine if a one-day session of wheelchair basketball games were held in conjunction with March Madness at a university’s recreation facility to allow students of all abilities to play a live game of wheelchair basketball. Imagine if a multi-day wheelchair basketball tournament consisting of multiple teams took place in an intramural setting on a college campus. Imagine college students with disabilities—and faculty, for that matter—playing alongside students without disabilities in a sport that needs no changing to foster inclusion. There are hurdles. How can we guarantee people will play? (Hint: Do some politicking among the most trusted students to gain support). How can we fund the purchasing of equipment? (Hint: Partner with a local wheelchair basketball team or rehabilitation center). 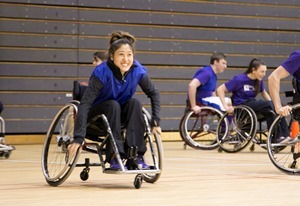 Implementing wheelchair basketball among intramural programming at a university could not only offer a competitive outlet for college students with disabilities, but it could also destroy stereotypes among college students who have never been exposed to adapted sport while also enriching their university experience. Isn’t that what we are tasked to do? Josh, how has the response been by the university? Is this something that will be part of JMU’s curriculum? The response by JMU has been fantastic! We have collaborated with individual athletic teams, the athletic department as a whole, the university recreation department, disability services, as well as different academic departments on campus–and the president’s office has been 100% supportive. Perhaps most importantly, athletics and university recreation have both been supportive by donating resources (facilities and personnel) but also being willing to say “yes” because they recognize adapted sport can reach a variety of audiences and it’s a way we can position our university as being a leader in this area.